Hi everyone! 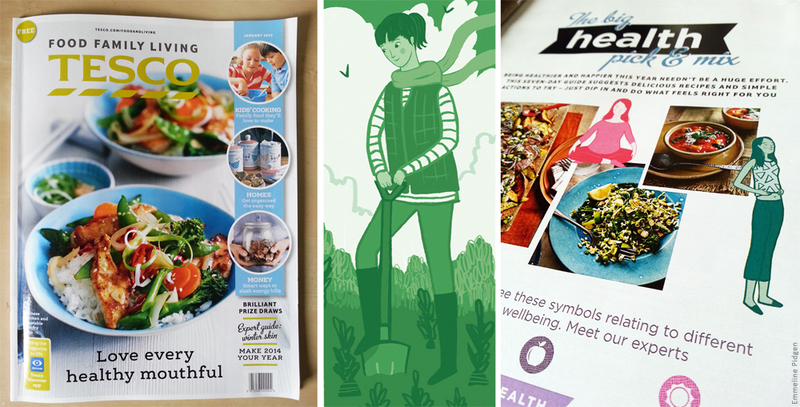 I'm totally excited to announce that Tesco Magazine's January issue is now out and features my illustrations throughout their Big Health Pick & Mix section! Check them out on pages 7-21. I have to say I made more than one excuse to 'need' to go to Tesco to check if the issue had hit the shops (I just had to have that butternut squash, okay?). With a readership of over 7 million, it's pretty damn exciting to be involved. It was a brilliant brief to work on, illustrating various health and well-being tips for the new year - lots of exercises, yummy food and activities to draw. There's a colour code for the different sections too, so it was great fun to work with a limited colour palette and keep things simple. I worked with Tesco earlier this year illustrating kid's word games and activities on their website (have a look here - Dinosaurs, pirates and trains!) but it was fantastic to work in print with them. I've been edging my way into more editorial work to go alongside my narrative illustration, and this has been my first major editorial brief to work on from scratch, so I'm chuffed. Hopefully you'll be seeing more in the future! Make sure you pick up a copy, they're free! There's some really great tips in the article, and some other ace features throughout (there's also a killer Tiger Beer advert illustration by Victo Ngai, goooorgeous!). If you're super keen you can browse the magazine right now online.